Heat oven to 350°F. In 2-quart saucepan, heat milk and butter over medium heat until butter is melted and milk is hot. Bread pudding is indeed an old-fashioned dessert, a comforting way to use up stale bread. Any type of bread makes a neutral base for a flavorful custard; use day-old sliced whole-wheat, raisin or sourdough. Play with how your season up the custard. Sweet spices are traditional, but you could take a savory turn with a few dashes of ground coriander, crushed fennel or anise seed, or even dried rosemary. In combination with some cinnamon, they make for an intriguing dessert. Chewy dried fruit adds a contrasting texture to the tender softness of the pudding. Dark or golden raisins, cherries, chopped figs or apricots add color and sweet-tart flavor. Skip the dried fruit and go straight to full-on indulgence—stir in chunks of dark chocolate or high-quality white chocolate that will gently melt into the bready custard. To make Chocolate Bread Pudding, substitute 1/2 cup semisweet chocolate chips for the raisins. 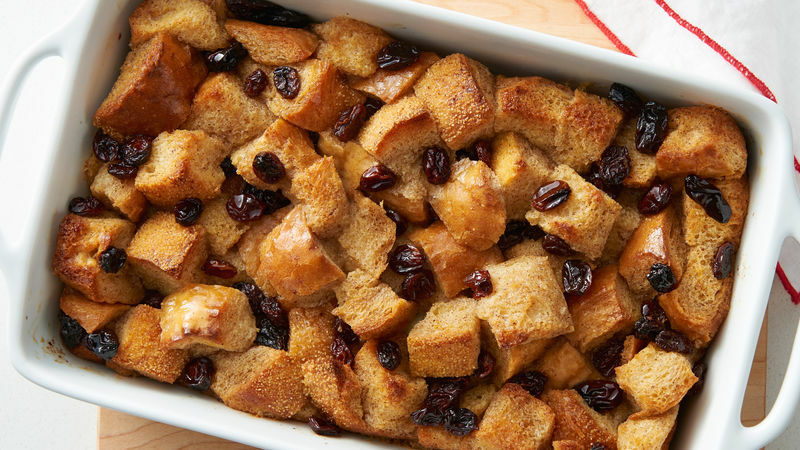 Back in 13th century England, bread pudding was called “poor man’s pudding,” since it was made from stale or leftover pieces of bread. How times have changed! Now, smart home cooks who want to reduce food waste rely on this bread pudding recipe to help them create a delicious dish from scraps and just a few other simple ingredients. If you’ve ever made French toast (and even if you haven’t), you can make this recipe. This dessert is made with the most basic of ingredients: milk, bread, sugar. Feel free to mix-and-match the types of bread you use, including sandwich bread, French bread, croissants or even stale panettone. Check out the comments sections for more tips and suggestions from fellow home cooks who love this recipe for bread pudding and have found some clever adaptations. Find a few more ways to satisfy your sweet tooth among Betty's best dessert recipes.